IT'S been four weeks since I started taking Roaccutane. If you read my post about why I decided to start taking it, you'll know it wasn't an easy decision for me to make. I'm sure many people who suffer from acne, however severe, feel the same. It's fair to say mine isn't horrific right now, but over the years it has gnawed away at my confidence in some way, so I thought I'd just sort it out once and for all. I started on a low dose of 20mg to ease me in. This way my dermatologist told me the initial purge is less likely, but still I was waiting for this with complete terror. I cancelled all my plans for the month due to serious worry it would be horrendous and destroy my confidence even further. Surprisingly, it never really came. In fact, the people who told me my skin 'wasn't even that bad anyway' before I started on the course began telling me how much better it looked pretty quickly. That's not to say it's perfect, or that I haven't had any spots for the last four weeks, but it's improved significantly. My foundation is fantastic to be fair; I use Illamasqua's Skin Base Foundation for amazing coverage. It's vegan too! Of course, my skin is dry. My lips are pretty much always cracked and I have been told they look dry too. I've been using every lip balm under the sun to try to combat this, but my favourites are La Roche Posay's Cicaplast Lips and Dr. Paw Paw's Lip Balm. My face isn't too dry, but I have been using Clinique's Moisture Surge Overnight Mask every night and applying Kiehl's Midnight Recovery Concentrate too. In the daytime, I use Burt's Bees Intense Hydration Day Lotion. I've never been the type of girl to moisturise my body every day (it's called laziness), but I have been making an effort to do it more. I've been using La Roche Posay's Iso-Urea Body Milk, which is super thick and hydrating and it's been totally fine. There's also something really lovely and luxurious about moisturising every day, so the process is pretty enjoyable! For the first few days, I had some unpleasant side effects. I felt nauseous and sick every time I took it and also experienced some digestion issues (soz everyone), until my sister told me you're supposed to take it with a large quantity of fat. I started taking it with some avocado on toast every day (being hipster has its positives, loool) which helped. While I had been taking vegan supplements every day along with my Roaccutane pill, I soon realised taking this many pills at once wasn't helping my nausea. Now I try to take them at separate meals which helps, although most of the time I forget to take the supplements! I went to see my dermatologist for my first follow-up appointment and had to show a negative pregnancy test to get my next prescription. I talk about this more here, but you can't get pregnant on Roaccutane as it can severely damage your unborn baby. I had a Mirena coil fitted as you legally must be on two forms of contraception, so that's been another struggle getting used to. I've had it before so it's not as big of a shock to the system, but it's just another thing you have to go through on the quest for clear skin. If you want me to write more about the experience, let me know and I'll write a post. I also had to have more blood tests to see how I'm reacting to the drug. We're still waiting for the results, but if they come back okay I'll need to double my dose to 40mg. Obviously, the prosepect of this is this is terrifying. 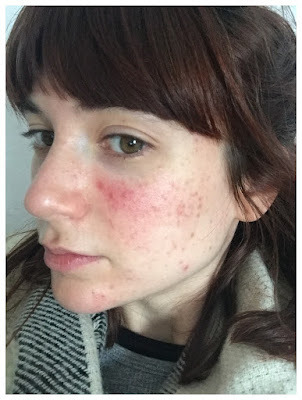 I was so scared before I started taking Roaccutane in the first place, so it was a huge relief when I found I could cope with the side effects. I'm slightly more worried that 40mg will pack a much heavier punch. But on the plus side, this means I can be on the drug for less time. At the current dose I'm on, I'd need to be taking it for around a year. You have to reach a certain number of milligrams as per your weight, and while I'm not sure how you calculate it, I do know I need to reach 7000mg before I can come off it. The dermi told me she usually increases people up to 60mg as you'd only need to be on it for around 4 months in total, but she was worried at the idea of me doing that due to my history of anxiety. I'm kinda glad, as I'm not sure I could handle it. As far as alcohol goes, I've had around one drink per week since I started the course. It's meant I've occasionally woken up with a headache, although this could just be a product of my own mind! If my dose goes up though, I think I'll give up this habit as so far I'm really enjoying not drinking and I want to make sure I'm as healthy as possible. It's just not worth the risk! So these pictures show how my skin has reacted so far. For those of you worried about serious breakouts, you'll see that doesn't always happen. There's definitely been an improvement, but you can see my skin is a bit dry (vom). While it's not perfect, I'm glad I've finally started taking Roaccutane and I just know the time will fly. I've also included this picture from February this year to show how far I've come with treatment (excuse the bad quality, it was just taken on my iPhone!). I've had people tell me my skin is fine now, but this is due to all the treatment I've had. I went on antibiotics for months before trying Roaccutane. When I took this photo, I was at a loss; my skin had never been so bad before. It looked completely fine with make-up on, so everybody thought I was being melodramatic, but without make-up I felt awful. I went on a beach holiday to Sri Lanka where it was silly to wear make-up, and I was embarrassed by my own face. It's worth fighting against anything that can make you feel that bad.